They were married, the pension record says, 220 years ago yesterday. Or maybe it was 218 years ago yesterday. It was one or the other, you see. And it darned near got Dorothy thrown in the hoosegow as an elderly widow looking for some back pension payments. And, of course, it was all because of the law. There are a couple of things that aren’t recorded in that Bible, however. The Bible doesn’t mention that David and Dorothy were first cousins, once removed. Dorothy’s maternal grandfather Thomas Davenport was the older brother of David’s mother, Dorothy (Davenport) Baker. The Davenports and Bakers all lived cheek by jowl in Virginia before moving together as a group to what was then Burke County, North Carolina, around 1777-78. And the Bible doesn’t record when David and Dorothy were married. 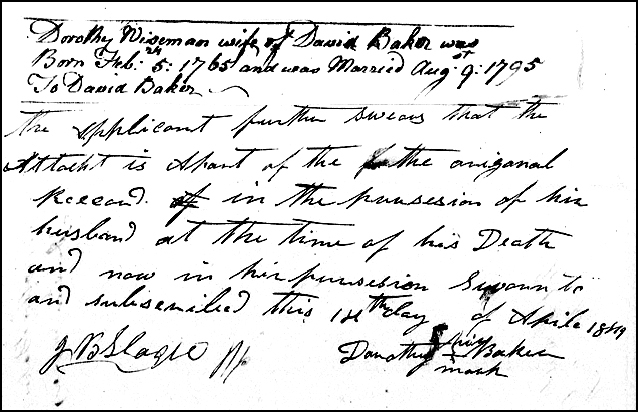 Now David was a Revolutionary War soldier, having served as a corporal in the Third Virginia Regiment from 1776 to 1778.4 Starting in 1832, David drew a pension because of that service. 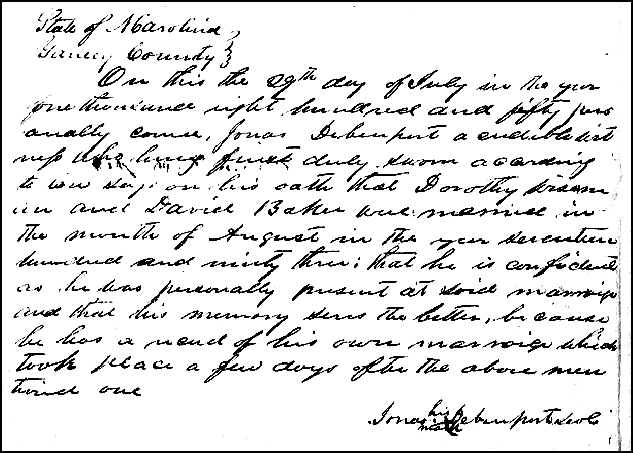 As you can see, it says David and Dorothy were married on 9 August 1795. Based on this and other documents, Dorothy was added to the pension rolls. Then another lawyer took over her case and told her she should get back payments starting from David’s death. 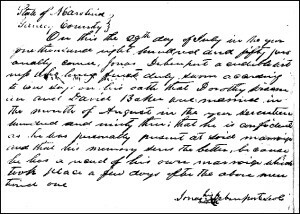 And another pair of cousins, William and Jonas Davenport, swore they were there at the wedding, and it had to have been in 1793. Jonas, whose affidavit you see at the top, even said he was sure about it, since his own marriage was just a few days later and he had a record of that date.10 Of course, he didn’t attach that record… and there’s none in existence today. Dorothy, then 85 years old, didn’t pursue the back payments any longer. And so it’s still not entirely clear, as a result, whether we’re celebrating a 218th anniversary or a 220th. But what the heck. Happy anniversary to my fourth great grandparents anyway. Our families’ heritage is frequently quite humorous! And often frustratingly so, Donna! In the long run I think she made the right choice. I am sure she was disappointed to not get the back payments but sometimes you have to know when to pick your battles. Realizing she had been backed into a corner with limited options was probably not pleasant but I would think that potential perjury charges at her age would have been very frightening. Definitely a great story! She certainly didn’t have a choice with the tough position the Pension Office was taking, Pat. But man… 1793? 1795? Wish I knew!